Bill Kenwright and Laurie Mansfield present the new musical about the life and legend of Cilla Black, which will open in her hometown at the Liverpool Empire from Thursday 7th – 16th September before embarking on a nationwide tour. Cilla’s son, Robert Willis, will be the Executive Producer. 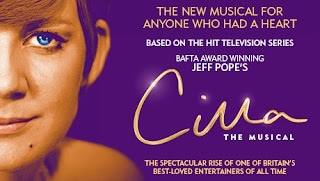 Cilla - The Musical, is a spectacular and heart-warming musical adaptation of the critically acclaimed ITV mini-series based on the early life of Cilla Black, by BAFTA award winner, Jeff Pope (The Moorside, Philomena, From The Cradle To The Grave, Mrs Biggs). Anyone Who Had a Heart, Alfie and Something Tells Me, alongside a backdrop of the legendary “Liverpool Sound” including the Beatles’ Twist and Shout, and American influences like California Dreamin by The Mamas and The Papas and many more. The producers of Cilla The Musical will hold national open auditions in the hunt to discover their ‘Cilla’ in the same way the star herself was plucked from obscurity before becoming the iconic Liverpudlian songbird. Tickers are on sale now!